BI, W.-X. : Studies on the Flightless Lamiinae (Coleoptera: Cerambycidae) from China, II. Echinovelleda Breuning, 1936, Paroriaethus Breuning, 1936 and Lonyarbon gen. nov.
KUDO, Y., H. KOJIMA, H. YOSHITAKE, Y. G. BABA and N. KOBAYASHI: Population Structure of the Flightless Supralittoral Weevil, Aphela gotoi (Coleoptera, Curculionidae) Inferred from Mitochondrial COI Sequences. OHARA, N. and K. KOGURE: A New Species of the Genus Parabolopona (Hemiptera, Cicadellidae, Deltocephalinae, Drabescini) from the Central Ryukyus, Japan. MASUMOTO, K. and K. AKITA: A Revision of the Genus Hoploedipinus KASZAB (Coleoptera, Tenebrionidae) Part 2. YOSHITOMI, H. and X. L. TRUONG: New Locality of Namtokocoris kem SITES (Hemiptera, Naucoridae) from North Vietnam. OHBAYASHI, N. and M. LIN: A Review of the Asian Genera of the Petrognathini, with Description of a New Species and Proposal of a New Synonym (Coleoptera, Cerambycidae, Lamiinae). 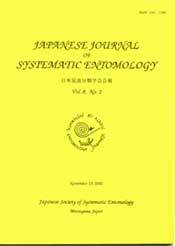 FUJII, T., H. YOSHITAKE, K. MATSUO and M. TOKUDA: Collection records of Darumazo distinctus (Coleoptera, Curculionidae) from galls induced by Asteralobia sasakii (Diptera, Cecidomyiidae) on the Izu Islands, Japan. KOJIMA, H. and K. MORIMOTO: Rediscovery of a Celeuthetine Weevil, Ogasawarazo daitoensis (Coleoptera, Curculionidae) after an Interval of Nearly Half Century.YOSHITAKE, H., S. MIYAHARA, M. NISHINO and K. SUZUKI: Metapocyrtus (Trachycyrtus) hederaephilus sp. nov. (Coleoptera, Curculionidae, Entiminae), a Pest of the English Ivy Cultivated in Mie Prefecture, Honshu, Japan. NAOMI, S.-I. : Taxonomic Revision of the Genus Stenus LATREILLE, 1797 (Coleoptera, Staphylinidae, Steninae) of Japan: Species Group of S. cephalotes SHARP (Part 1). KURAHASHI, H. and S. H. TAN: Two new species of the genus Phallosphaera ROHDENDORF, 1938 from Malaysia (Diptera, Sarcophagidae). ASANO, M.: Taxonomic Notes on the Genera Dicranolaius and Intybia of the Borneo Island, with Description of a New Species (Coleoptera, Malachiidae). WATANABE, Y.: Description of a New Paederine Genus Nipponolathrobium (Coleoptera, Staphylinidae), with Two New Species from Japan. LEE, C.-F. and J. BEZD?K: Taxonomic Status of Cneorella spuria (sensu KIMOTO, 1969) (Coleoptera, Chrysomelidae, Galerucinae) in Taiwan. MASUMOTO, K. and K. AKITA: New Strongylium Species (Stenochiinae, Tenebrionidae, Coleoptera) from Laos (Part 2). SHINOHARA, A. and H. HARA: Arge cerasus n. sp. (Hymenoptera, Argidae) Feeding on Cerasus spp. in Japan. HARA, H.: Heterarthrus fasciatus (Hymenoptera, Tenthredinidae), a Leaf-mining Sawfly of Populus spp. in Northeast Asia. HAYASHI, T.: Taxonomic Studies on the Oriental Species of the Genus Paralimosina PAPP (Diptera, Sphaeroceridae), excluding the eximia Species Group. IV. The Species from Vietnam. MURAO, R. and T. MATSUMURA: Occurrence of Lipotriches ceratina and Nomia incerta (Hymenoptera, Halictidae) in Nepal. HOSHINA, H.: New Record of the Genus Cephennodes (Coleoptera, Staphylinidae, Scydmaeninae) from Yaeyama Group, the Ryukyus, Japan, with Description of a New Species. ITO, N.: A New Species of the Genus Oxycentrus from Thailand, with a Redescription of Oxycentrus castaneus (Coleoptera, Carabidae, Harpalini). HAYASHI, Y.: Description of a New Species of Dinothenarus from China with Some Notes on the Genus (Coleoptra, Staphylinidae). ITO, M., K. WATANABE and K. MAETO: Spilopteron luteum UCHIDA and S. mucronatus LEE (Hymenoptera, Ichneumonidae, Acaenitinae) New to Japan. TAKASUKA, K., K. WATANABE and H. YOSHIDA: New Records of Zatypota albicoxa (Hymenoptera, Ichneumonidae) and its Potential Host Spider Parasteatoda tepidariorum (Araneae, Theridiidae) from Vietnam. Wei, M. and W. Xiao: A New Genus and a New Species of Cephidae (Hymenoptera) from China with a Key to Genera of Hartigiini s. str.